The Center for Disease Control and Prevention (CDC) says people with the flu can spread it to others up to about six feet away, mainly by droplets made when they cough, sneeze or talk. A person can also get the flu by touching a surface or object that has the virus on it and then touching their own mouth, nose or eyes. Basically, any bodily opening will do. If you work in an office, as many of us do, chances are you sit (or stand) within six feet of a colleague and touch dozens of their icky contaminated surfaces each day. But the good news is, there are steps you can take at work to help reduce your chances of getting (or spreading) the flu. Hello cubicle coughers, open space sneezers, corner office blowers, home den fevers and coffee shop sore throats. My name is Brock Armstrong and I am… not the Workplace Hero. The goal of this podcast is to make you into a Workplace Hero. Plus I am currently not feeling all that heroic. If you have been listening to this podcast for a while, you may have noticed that my voice sounds a little different than usual. That is because… I am sick. Yep. I have a cold. In June! How lame is that? Luckily, I am nearly over it and I am also hopped up on cold meds… which could also account for why I sound weird. In any case, today’s topic is timely because it is all about being sick in the workplace. 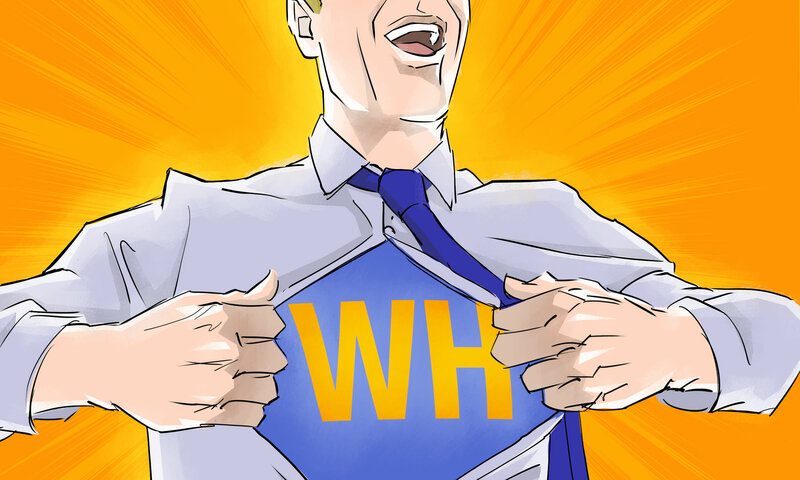 Before we continue, I encourage you all to visit the webpage workplacehero.me/weightless. That link will take you to where you need to go to find everything you need to know about a new project that I have started with the Nutrition Diva herself, Monica Reinagel. The catch phrase for this project is: Are you ready to stop dieting and start weighing less? The program I am talking about is called Weightless and it is a structured lifestyle change program that combines nutrition science, behaviour modification, professional guidance, and community support. This evidence-based approach is based on research led by the National institutes of Health and has helped thousands of people permanently shed fat and lower their risk of diabetes and other diseases. This is not a diet or an exercise program. You won’t be counting calories, measuring foods, eating special bars or shakes, or following rigid meal plans or workout regimens. You will not have to eliminate your favorite foods, battle constant hunger, feel awkward at professional events, or gnaw celery sticks at special occasions. To find out more, head over to workplacehero.me/weightless and sign up now. Ok… now back to how you can defend yourself and protect your coworkers from disgusting illnesses in the workplace. The first thing you can do is clean and disinfect commonly touched surfaces. Viruses on surfaces like sink faucets and door handles can spread rapidly, especially in public places such as offices and schools. A study for The Healthy Workplace Project by Dr. Charles Gerba of the University of Arizona found that implementing the program’s “wash, wipe, sanitize” protocol in the workplace reduces the probability of catching the flu or common cold by 80%. It can also reduce the number of surfaces contaminated by viruses by 62%. Notice that I didn’t use the word ‘germs’ like they do in the commercials for those overly ambitious cleaning products. Wondering why? Well, its because germs aren’t a thing. They don’t actually exist. They are little animated monsters that have been made up to scare you into buying way too much hand sanitizer. When people say the word germs, they really are referring to the microscopic bacteria, viruses, fungi, and protozoa that can cause disease. Most of which can be washed away with good old water and some regular soap. The only time I will ever advocate using a sanitizer is when you are very sick, very contagious and not able to stay home from work. Ok… I will get off my non-antibacterial soap box now and get back to the tips. The next tip is… I already mentioned it but I will say it again – wash your hands with soap often. This is especially important before eating, after using the restroom and after being outside. Use regular soap and warm water for 20 seconds. It is also important to wipe your hands dry with a clean, fresh towel because friction actually plays a large part in the hand cleaning process. The next tip is one that some people might be afraid to talk about but I am not because I like science – get vaccinated. Get your flu shot. According to the CDC, an annual seasonal flu vaccine (either the flu shot or the nasal-spray flu vaccine) is the best way to reduce your chances of getting the flu and for most of us more importantly it is the best way to reduce your chances of spreading it to others. Yes, maybe you are not afraid of getting sick but that immunocompromised infant or nice old lady on the bus may not be so cavalier with their health. Don’t be selfish, it’s just a tiny needle. Next tip is to take steps to prevent the spread of germs. Cover your nose and mouth with a tissue when you sneeze and then throw the tissue away. If you don’t have a tissue handy, use the inner part of your sleeve at the elbow, just like Dracula does! One sneeze can spray up to 3,000 infectious droplets into the air at more than 160 kph. Here’s a good tip that I didn’t think of until I read it on Forbes.com – wash your coffee cup with hot soapy water. If people around you are getting sick, the things that we drink from offer a quick way for germs to enter our system if they inadvertently become contaminated. And no, that cursory rinse isn’t enough to remove the contamination, so give it a good wash.
Next tip – if you are sick, stay out of the office kitchen. Most people don’t realize that office kitchens are often a breeding ground for the flu. Try not to share eating utensils, dishes and linens if possible. And if you do, take responsibility and wash them yourself. Don’t leave them for someone else to deal with. Come on! Here is a bit of an antisocial tip: limit interactions with co-workers and avoid shaking hands with people. Few people will take offence if you offer the lighthearted response that with the flu going around, you’d rather be safe than sorry. You’ll also want to limit casual conversations with co-workers if there is an illness outbreak. If a co-worker shows signs of the flu, politely ask them to go home if possible and if they don’t, try to keep your distance from them. Remember the 6 feet rule. All in all, this is likely the best tip: maintain a healthy lifestyle. Get plenty of sleep, stay hydrated, exercise in the fresh air, eat plenty of vegetables and fresh meat and avoid sugary fruits, treats and beverages. But interestingly enough, being well-rested is one of the greatest ways to avoiding getting sick. And the final tip for today – if you get sick, stay the hell home! If you do get sick and have flu-like symptoms, the CDC recommends that you stay home for at least 24 hours after your symptoms start to improve. If you can, stay home longer but that is when you are likely not contagious any longer… but that doesn’t mean you should do around coughing on everyone and sneezing into the open air! Follow your company’s procedure for calling in sick. Find out if you’re required to call HR and/or your immediate supervisor, and contact them immediately. Try to give your employer sufficient notice, if possible. If you’re not feeling well at night, let your supervisor know you might not be able to come in the next day. Notify your immediate supervisors and managers via e-mail and phone. This ensures the message is received in a timely fashion and they can get someone to cover for you, if necessary. Always notify the people you work with on a daily basis and communicate your list of urgent to-dos. And finally, use the time off to rest and recover. Don’t spend your sick day(s) worrying about work. Allow your body to recover and get well as quickly and thoroughly as possible. And now – it wouldn’t be a Workplace Hero episode without homework. So based on the studies that microbiologist Dr Gerba did at the University of Arizona, that ranked the highest levels of bacteria in office spaces, your office telephone is the nastiest offender of all — followed by your desk, computer keyboard, mouse, fax machine (who even has those anymore), copy machine and men’s toilet seat. Dr Gerba said, “The phone is typically the dirtiest piece of equipment in an office because it goes straight to your mouth, and you never clean or disinfect it.” So there is your homework. Next time you go to the office, grab a clean rag with some soapy warm water and give that telephone receiver a bath! Be careful not to get it too wet, you don’t want to wreck it, but give it a decent wash, rinse and dry. I am sure you and your immune system will be happy that you did. The CDC says that an employee should always call in sick when the illness is still contagious and his or her productivity will notably decline due to the illness. If you know that the quality of your work will be negatively affected due to your illness, it is best for all parties involved to call in sick. You are not being a wimp, you will not get fired, you are actually being a good employee, colleague and friend. Now, I am going to go lay down while you go and make this week a healthy one! Workplace Hero is researched, written, narrated and recorded by me Brock Armstrong in downtown Vancouver. Additional help from Eleanor Cohen and artwork by Ken Cunningham. Today’s Heroic idea came from the nasty virus that decided to take up residence in my sinuses. Screw you, you little jerk. Oh how I wish the world would listen to this and stay home – I don’t want whatever you have and neither does anyone else!! Thanks for your great message!